Emma Kokai was renamed “Mimi” by her grandson Loic and the new name meant a new beginning for her. Injured in a car accident in 2004, Mimi had to face her own vulnerability and confusion that shaped her into a different person. In society we can often be labeled and stereotyped because of mental illness or physical disability, but Mimi strongly believes that people with disabilities are not useless. 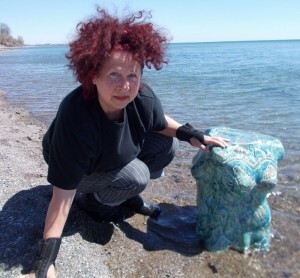 Therefore, from 2010 to 2014, guided by her own personal experience, Mimi went back to OCAD University, and with the help of her family, colleagues and peers, she regained her creative ability in the ceramic medium. Mimi Kokai’s new ceramic sculptures are impressive with provocative ideas, incorporated with innovative designs. Mimi’s work is the culmination of her dedication to rediscover herself as an artist in society in order to create art that means something to people. In her art, Mimi explores the human body and mind with its vulnerability and imperfection which is the path to the very heart of human existence where our consciousness is engaged in the “drama of being”. Her installation pieces articulate the beauty of our being with a human condition that needs to be included, recognized and loved by society.